First, submit your application request using the Online Request Form on the Waseda University Residence Life Center website (obtain a Registration Number).Before application,select Dormitory.We recommend applying for a Waseda University Student Dormitory as your first choice and a WID or Waseda Recommended Dormitory as your second choice simultaneously. After being accepted by the University,submit the Online Request Form on the Residence Life Center website to obtain your Registration Number. You will receive a confirmation email or phone call from Kyoritsu Maintenance Co., Ltd. within 10 days of submission of your Online Request Form. You will receive your entrance documents including dormitory agreement and payment slip. *Documents will be posted by Kyoritsu Maintenance from early November. Documents will be posted by Kyoritsu Maintenance. Make payment of the initial cost by the date designated by Kyoritsu Maintemance Co., Ltd.※*Kyoritsu Maintenance Co., Ltd. will send an entrance certificate and “Notice of Move-in Date” by post.Your room will be ready for move-in anytime after the contract period begins. Dormitory Agreement between you and Kyoritsu Maintenance is concluded. once accepted at a Waseda University Student Dormitory, you must enter that dormitory and cannot change to another dormitory for any reason. In that case, the WID or Waseda Recommended Dormitory that you simultaneously applied to will refund all entrance costs that you have already paid. Q.What are Waseda University Student Dormitories and Waseda University Affiliated Dormitories? Waseda University Student Dormitories are operated by Waseda University. These include Waseda International Student House (WISH), Higashi-Fushimi Student Dormitory and Ichijima Kinen Sendagi Student Dormitory. The contract for residents and dormitories are concluded with Waseda University. Waseda University Affiliated Dormitories are operated by affiliated companies (companies in affiliated relationships with Waseda University). The contracts for these dormitories are concluded between the resident and each affiliated company. Q.I hope to enter a dormitory. Tell me what I need to do. You may apply for dormitories upon acceptance to the University. Both of Waseda University Student Dormitories and Waseda University Affiliated Dormitories can be applied through “Online Request Form” on the website of the Residence Life Center during the application period. “Online Request Form“ is opened on our website only during the application period. Q.Is there anything that I need to consider before applying? A life in student dormitory is a community life and it is different from a life in your own home. Please understand a life that differs from the one of your home will start after entering student dormitory. Students from all corners of Japan and the world live and study together. Please take it into consideration that living in student dormitory is different from living alone before applying. (For example: Waseda International Student House (WISH))In principle, four (or three or two in some cases) people make one unit sharing one living room. The residents may hear living noise, etc. as rooms are fitted with vent holes for natural ventilation and this is a space for communal life. Thus, unit sessions are regularly carried out, to which all unit residents shall participate and discuss rules within the unit such as the volume. However, please note that living in WISH differs from living in an apartment or a condominium mansion and the residents may hear living noise. When applying for Waseda University Student Dormitories (Waseda International Student House (WISH), Higashi-Fushimi Student Dormitory, and Ichijima Kinen Sendagi Student Dormitory) as your first choice, you may simultaneously apply for WID and Waseda Recommended Dormitories as your second choice (multiple applications for other combinations are not permitted). 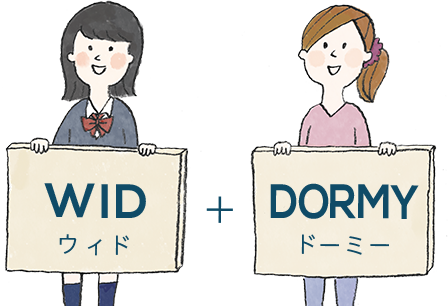 You are allowed to specify up to a 6th choice in WID and Waseda Recommended Dormitories, which will ensure that you will be accepted in one of WID and Waseda Recommended Dormitories if you were not accepted at Waseda University Student Dormitories of your first choice. Waseda University Student Dormitories (Waseda International Student House (WISH), Higashi-Fushimi Student Dormitory, and Ichijima Kinen Sendagi Student Dormitory) and Espoire Mejiro conduct document screening. WID and Waseda Recommended Dormitories do not have screening and take in residents on a first-come-first-serve basis. Q.Tell me the time required to go to the Waseda campuses from the dormitories. Refer to “Commuting time estimation to Campus” on page 4. Information (as of September 2016) on the 3-month train pass is also provided. For more information on access, check the page for each dormitory. Q.Is the move-in dates designated? After being accepted at a dormitory, the move-in dates are designated by the Residence Life Center and affiliated companies. As a rule, you are required to move-in the designated date. Q.Can I visit the dormitories? You can visit whenever you want , but please call our office before you visit. Q.Can I choose the contract period? Yes, you can. Longer contracts are more economical. There is no restriction on extension for undergraduate and graduate students while enrolling Waseda University.It is also possible to transfer to another dormitory within the contract period. Q.I am planning to enter the School of International Liberal Studies. Is it possible for me to conclude 1.5 year contract? Only students in the School of International Liberal Studies, which includes an overseas study program starting the summer of second year for all students,may tie a 1.5-year contract with Waseda University International Dormitories (WID) and Dormitory Toritsu Kasei (only female). 1.5 years is considered a full term and deposits will be returned. Only half of the management fee will be charged for the second year. Q.How are the residents selected? Residents are selected on a first-come-first-serve basis. Please submit your application after being accepted at Waseda University. There are no application documents. Q.How is the security at the dormitory? All buildings are fully equipped with automatic door locks and 24-hour videorecording cameras. Q.Can I choose without meals option? You can choose without meals option depending on dormitories. Also, you can change with ⇔ without meals option only once within the contract period. If you will eat meals about a half of month, it is more economical to choose with meals option. Q.Is it possible for me to cook for myself on days meals are not served? You may cook at the kitchen corner. Residents cook or eat out depending on their lifestyle. Q.Are there hierarchical relations in the dorm? No, there aren’t. All residents are good friends and the atmosphere is very homey. It is possible to maintain your privacy in your own room. Q.Is it possible to apply for dormitories outside the Online Request Form acceptance period? It is possible to make application anytime for WID and Waseda Recommended Dormitories if there are vacancies. Please call and inquire.